For many glass collectors, finding a beautiful treasure with antique glass markings is a special treat. After all, part of the fun of collecting antique glass is solving the hidden mysteries of each unique piece of glass in their collection. The category of antique glass takes in a wide variety of different types of glass and glassware made over centuries of time. It includes everything from elegant glass and signed art glass pieces to Ball canning jars and other utilitarian items made of glass. 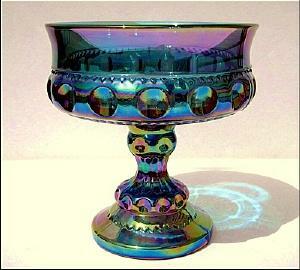 Each era has a vast array of glass manufacturers making countless pieces of glass in numerous styles and designs. Many glass manufacturers and patterns are well known, such as Rosepoint by Cambridge Glass Company, Adam by the Jeannette Glass Company or the Silhouette glass stemware of the Libby Glass Company. Others are much more obscure such as Tiffany pastel glass, Butterfly and Floral by the Roden Brothers of Montreal or Beaded Shell Pressed Glass by the Dugan Glass Company. Most often a glass mark is on the bottom of the piece, but there are some pieces that are marked on the side. Sometimes a mark has faded over time and using a magnifying glass or a jeweler's loupe in good lighting may be necessary. Most pieces of old glass do not have any glass markings. Check for excessive wear and scratches on the bottom. If the piece is gilded, it may show signs of wear. Many times a glass makers mark was a type of branding called an acid badge. Many pieces of glass from the middle of the 1800s and newer have registration numbers. Earlier pieces may have a diamond mark to show the design was registered. Often when an artist signed a piece of engraved glass the signature was formed as part of the design and is usually very small. After 1905, it became common to sign cut glass pieces as companies tried to protect their patterns from being copied. Glassware with a stopper, such as a perfume bottle or a decanter, from the 1800s and 1900s should have matching numbers on the stopper and the bottle. Often the numbers were scratched on the stopper's peg and the bottle's neck. Antique glass markings help solve the mystery of the old glass piece's past and provide clues for identification, value and authenticity.